On Friday, April 5, approximately 165 patrons enjoyed a wonderful Titanic-themed dinner at the Russell County Conference Center in Lebanon, Virginia. Titled Remember the Titanic: The Facts and the Fiction, the event comprised part of the area’s annual Festival of the Arts, sponsored by the Russell County Rotary Club, and initiated and planned by faculty members of Southwest Virginia Community College. 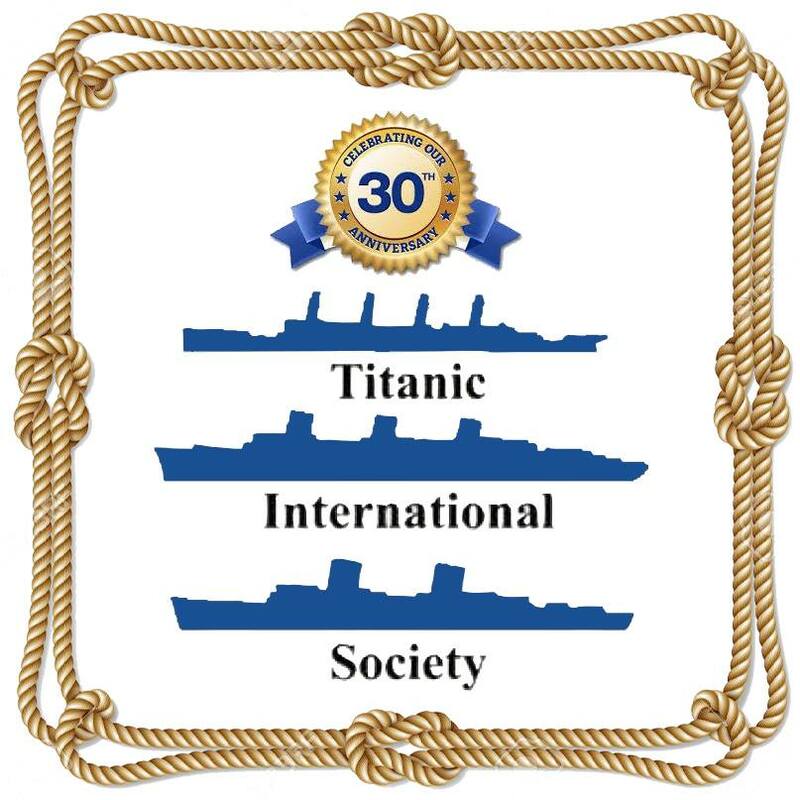 Brandon Whited, a trustee of Titanic International Society, served as an historical consultant for the dinner, and also wrote sixteen brief biographies of various Titanic passengers and crew, which served as part of the event’s main presentation. For those behind the scenes, the evening began long before the first “passengers” arrived to “board.” Facsimile labels were affixed to many bottles of common champagne, chardonnay, merlot, and grape juice, thus creating commemorative Titanic wines, claiming to have been bottled in Europe and marketed for the specific purpose of celebrating Titanic’s maiden voyage. The numerous tables were set with the proper Edwardian arrangements of silverware, serving dishes, and glassware. Throughout the conference room, life rings and other faux ocean liner paraphernalia were affixed to the walls. A local woman with a strong interest in the Titanic kindly provided a selection of items from her collection, including replica china from all three classes, a 1924 trade magazine describing several White Star Line vessels of the day – including images of Olympic – and a few books from her personal library that guests could browse through before dinner, including a 1912 copy of the Logan Marshall book. Her memorabilia was displayed in the outer hallway, supplemented by facsimiles of April 1912 newspaper reports covering the disaster. As the guests entered through the main doorway, which was decorated to resemble an ocean dock, Brandon was on hand to chat with the guests, answer any questions they might have had regarding the story of Titanic, and of course, inform those whom professed a strong interest about how they might join Titanic International Society. An elderly gentleman shared a particularly interesting story: When he lived in Florida, he was friends with a lady who had grown up in Queenstown, Ireland. Born in 1898, she was fourteen years old in April 1912, and she watched the Titanic depart from Cork Harbor on April 11. It was a tale, he said, that she often repeated, and as she advanced in age it took on a sad overtone. She would tell the story and, shaking her head sadly, look at him and say, “And it never came back….” It was as though she no longer understood why that beautiful ship that she had watched depart Queenstown one afternoon so many years ago never returned. The gentleman said his friend lived to the incredible age of 105, passing away around 2003. During a sumptuous dinner, catered by Your Grate Escape of Tazewell, Virginia, and based upon the Titanic’s first-class dinner menu for the evening of April 14, 1912, sixteen guests read from large index cards brief biographies of Titanic passengers and crew, including several names not normally mentioned in texts about the disaster. Represented were the famous names of Benjamin Guggenheim and Captain Edward John Smith, but also recounted were the stories of Claire Karnes, Augusta Goodwin, and Robert Williams Daniel. Particularly commendable was the young man who portrayed child survivor Douglas Spedden. He not only read the story very well, with energy and enthusiasm, but also dressed the part, complete with a teddy bear tucked under his arm. A great evening of remembrance was wrapped up with a beautiful performance by classically trained violinist Arvel Bird. Bird, a native of Ayrshire, Scotland, released in 2012 a CD of original compositions commemorating the centennial of the Titanic disaster. Accompanied by his wife, Bird performed a number of these pieces, supplemented with footage from various Titanic films and a slideshow of images from the Father Browne collection. Remember the Titanic: The Facts and the Fiction was a wonderful way to bring the story of the famous ship to the heart of southwest Virginia. Brandon was honored to be given the opportunity to be a part of it, ensuring further remembrance of the ship and those aboard her, as well as informing others of the mission of Titanic International Society along the way. It is his hope that a similar event will be held next year. Trustee Michael Poirier and TIS past president Shelley Dziedzic visit the International Ice Patrol for wreath ceremony, April 10th. This was the first visit TIS has made to the International Ice Patrol’s headquarters since they moved from the old building at Avery Point. The new location is on the Thames River in New London, right across from General Dynamics which you can see through the window in one of the photos. After the wreath ceremony we were invited to inspect the nerve center of operations where we learned a lot about updated berg tracking methods using GPS. We met the crew preparing to leave for St.John’s within the hour for a 9 day patrol and wreath drop and that currently there are 8 bergs in the coordinates of Titanic’s location. It has been a heavy ice season which will terminate August 1. Stay tuned for more on the new tracking methods and use of drones in an upcoming edition of VOYAGE.